Turns out, you don’t have to call the dry-cleaning guys once you get a stain on your mattress. I once had a dry-cleaning guy who could tell the difference between the urine stains of a human, cat and dog by smelling it. I mean… seriously? Whether you have a cat that pees on your bed or your kid goes through the bed wetting stage, know this: getting stains out of your mattress is easy. Most likely, something is wrong with your cat’s litter box, or your cat has anxiety or other health-related issues. Don’t yell at your cat for peeing on your mattress! Studies show that from 5 to 7 million kids wet their bed some or most nights, up until they naturally gain bladder control at night. Or if you’ve spilled some coffee on your bed, while browsing through photos of your ex on Facebook, well, blame yourself. Or the fact that your ex has gotten so fat. Either way, you need to get rid of the stains on your mattress, whether it’s urine stains, blood, coffee or sweat stains. Avoid getting too much of the cleaning liquid on your mattress (trust me,I know how tempting it can be to throw the whole bucket of water on your mattress just to get those nasty stains out). Mattresses tend to dry out for long periods of time. 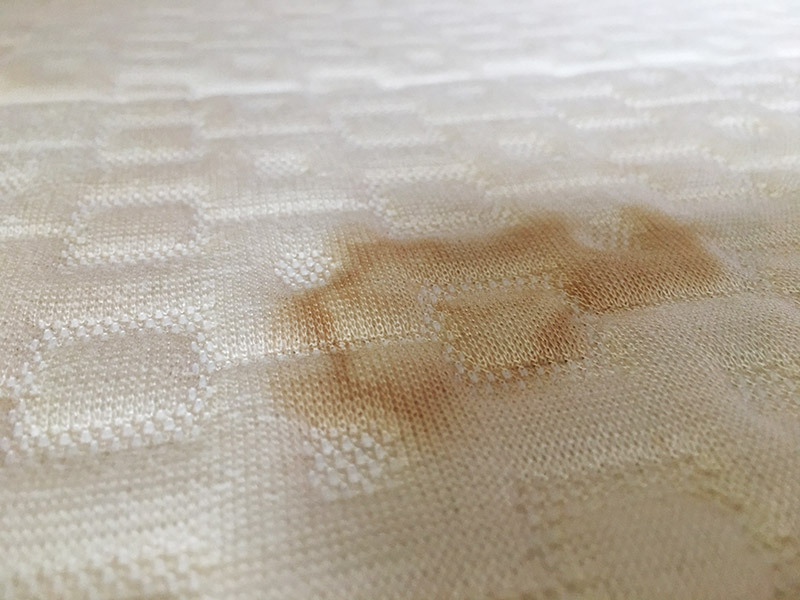 Any mattress that stays wet for a long period of time may develop a nasty smell and even give birth to fungus and mold (you don’t want them to replace urine stains on your mattress). There are two ways to get stains out of a mattress. The first one is best used to get rid of fresh stains, while the second one is more effective against old stains. Add a few tablespoons of salt to a glass of water and stir it up. It’s crucial that the solution is very strong. Apply the solution to the stains on your mattress and leave if for a few minutes. Using a sponge or a cloth, thoroughly wash the stains with water. Let the mattress dry out. If the stains haven’t disappeared, repeat the procedure one or two more times. Add about 20-25 grams of citric acid to a glass of water and stir it up. Apply the solution to the stains with the help of a sponge or a cloth. Let the stains dry out for a few minutes. Now wash the stains with water. So now that you know how to get stains out of your mattress, you don’t need to call those stains-sniffing dry-cleaning guys anymore!